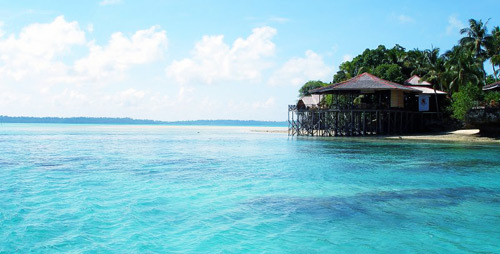 Berau is one of six regencies in East Kalimantan, and it has been known as the paradise for marine tourism in Indonesia. By the beautiful beaches and coral reefs, those who live in Berau should certainly be proud. In addition to the natural beauty of the underwater, Berau is also has other interesting destination like the cultural heritage, the virgin Islands and the genuine forests. Berau is one of those regencies that give big foreign exchange, in case of their tourism potential. By the existence of Derawan Island or Maratua Island, make Berau increase to be one of the exotic destinations in Indonesia. As we know, Derawan Island, together with Maratua, Sangalaki and Kakaban become the increasing famous archipelago that most visited by the divers or those who come to Borneo, especially in Berau. In addition to its coral and fish diversity, the Derawan chain contains Indonesia’s largest nesting site for endangered green sea turtles, which emerge from the sea every night to lay their eggs on the white sandy beaches of Sangalaki and Derawan Islands. Another island in the chain, Semama, is an important bird sanctuary, and Kakaban Island contains the world’s largest and most diverse jellyfish lake, with four unique species of stingless jellyfish. Moreover, Kakaban is also nominated as UNESCO World Heritage Site. In the surrounding waters there is Marine Park and is renowned as a tourist submarine for diving spot with a depth of about five meters. There are a wide variety of marine lives here, such as squid (cuttlefish), lobster, ghost pipe fish, octopus (octopus bluering), nudibranchs, sea horses, ribbon Eels and scorpion fishes. On a coral rock at ten meters depth, there is coral rock known as “Trigger Blue Wall” because of the reef with a length of 18 meters there is a lot of trigger fish (red-toothed trigger fishes). Beside, in Derawan Islands there are several small islands and coastal ecosystems which are very important such as the coral reefs, sea grass beds and mangrove forests. In addition, many protected species in the Islands of Derawan like green turtles, hawksbill turtles, whales, dolphins, clams, coconut crabs, mermaids, barracuda fish and some other species. The Islands in Derawan archipelago is about 31 islands, which is some of them are bar (gosong) and atoll. For the information, atoll is a coral island that surrounding by a lagoon in partially or completely. The used of the lands by local inhabitant in these island is only limited for the home living. In addition, the land of the island in the Derawan archipelago still in the form of mangrove forests, thickets, limestone forest in Maratua and coconut vegetation. The types of coral reefs in Derawan Islands consist of reef edge, barrier reefs and atolls. These atolls have been formed into an island and being a lake of salty water and it has 460 to 470 numbers of species indicates that this is a wealth biodiversity, giving it the world’s second highest level of hard coral diversity after Raja Ampat Islands in eastern Indonesia. If the exotic marine park in Berau is never satisfying you, other destination in case of cultural and or even the culinary will make you enchanted. So, have a bag pack for Berau will never been failing you.